With the 5 60 pointers in a row, Bob Stoops is creating a legend for himself and the 2008 Sooners that will be hard to surpass. He and the Sooners have been unappreciated by the media almost from the beginning. However, I was impressed with Brent Mussburger last night on ABC. For the first time in my memory, he actually bragged on the Sooners. He has been a Sooner Hater ever since I attended there back in the early 80's. I think, perhaps, the Switzer Scandals bad taste has finally been removed and/or replaced. It gets really depressing week after week to hear him dis the Sooners, even though we score 50 and 60 points per game. 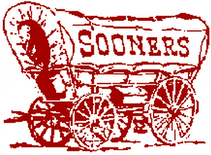 The Sooners do have a rich football heritage and last night showed that it is still a work in process! I'm just a little jealous! M. Steve, ya'll played a good game and we watched it all. It's been a fun season with the two of you razzing one another. I don't know about Rick, but I saw what the Gators are capable of, and . . .
Let me just say, BOOMER SOONER!